​In this article, we short-list the top queen sized mattresses that are priced under $300. Our aim is to provide you with the essential information needed for you to decide which is the the best mattress within your price range. There are a horde of tips and tricks you can follow to buy a mattress at a great price online or in brick and mortar stores. Even better there are certain times of the year when mattress sales are at their max and consumers can get a mattress at a budget price. However, you cannot wait for a specific time of the year to buy something as important as a mattress. Among the pieces of furniture in your house, the mattress gets used a lot seeing that averagely we spend eight hours a day in bed. Being on a budget should not prevent you from enjoying a good night's sleep and staying healthy while at it. There are good queen sizes mattresses that cost below $300. The relatively low price of these mattresses does not mean that they are lacking in quality, nay. This is a guide to help you choose the queen size best mattress under $300. The Zinus Memory Foam 12-Inch Green Tea Mattress was created to offer a good night's sleep thanks to its memory foam material which keeps the shoulders and the hips in alignment. By relieving the pressure points, the mattress is able to keep the spine straight and reduce back pain; this consequently improves the health of an individual. 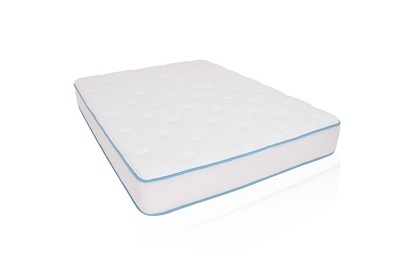 It is designed to fit side and back sleepers; this is facilitated by the shape conforming quality of memory foam. This is a three-layered mattress for maximum comfort and support. The top layer is a 2-inch memory foam, beneath which is a 2-inch pressure relieving foam, while the bottom layer is a 4-inch airflow base support foam which is highly dense. While the top and the middle layers are relatively soft to offer comfort by conforming to the shape of the sleeper, the bottom layer is made of a high-density material to offer support. 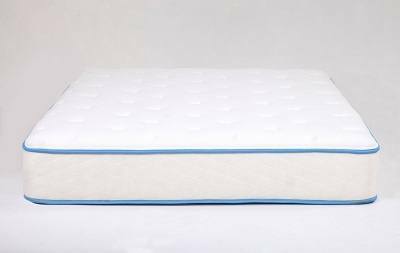 The mattress is CentriPUR-US certified to guarantee its durability, content and overall performance. To keep the mattress fresh at all times, it is fused with natural green tea extract. The extract counteracts the characteristic smell of memory foam mattresses. It is shipped compressed, and you may have to wait for a couple of hours to decompress. This Queen-Size Mattress weighs 67 pounds when completely decompressed. On Amazon.com, the Zinus Memory Foam 12-Inch Green Tea Mattress has garnered thousands of reviews most of which are positive. It is praised for its great price and its performance. A high number of reviews cite the great balance between comfort and support while others cite how well the edges hold up. However, a couple of reviews are negative, most complaining of the durability of the mattress. The same company has its own Zinus 14 inch mattress foundation bed frame to match their mattress. Its 14 inch height gives so much storage space to put under the bed. 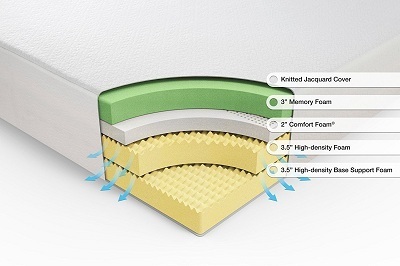 Created for maximum comfort and support, LUCID 10-Inch Gel Memory Foam Mattress combines a 2.5-inch gel memory foam ventilated layer with a 7.5-inch high-density support foam layer. This offers a pressure relieving and medium-firm feel. It is infused with a heat-capturing gel material with the top memory foam reducing heat build-up. The microscopic gel beads take heat away from the body keeping you comfortable throughout the night. This is coupled with the ventilated design of the memory foam layer and the open cell structure of the mattress to deliver a comfortable feel with improved airflow for a long time. 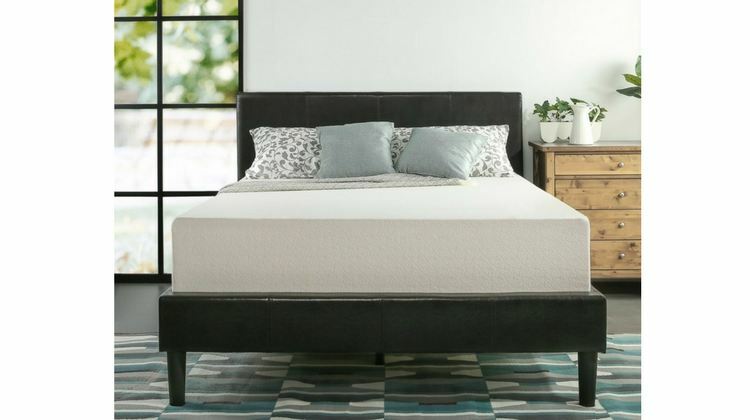 The cover of this memory foam mattress is made of 10 percent TENCEL lyocell and 90 percent polyester; this gives it a soft feel and creates a breathable layer of air at the mattress top. This cover is also moisture controlling ensuring maximum comfort during sleep. This CentriPUR-US certified has been tested for safety, performance and environmental friendliness; ergo, it does not contain ozone depleting substances, formaldehyde, PBDEs, CFCs, phthalates or any natural or synthetic latex. The manufacturer offers a 25-year warranty as a guarantee of durability. 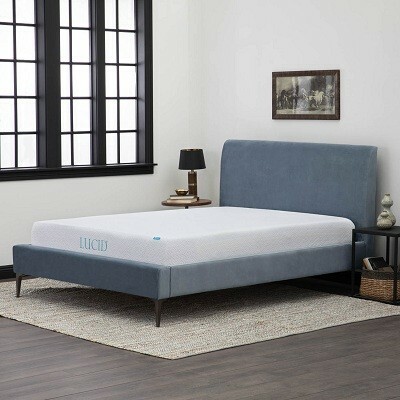 Like any other mattress, the LUCID 10-Inch Gel Memory Foam Mattress is shipped compressed and will take a few hours to decompress on unboxing. On Amazon.com, the reviews are positive for this gel mattress under $300. Most state that the mattress performs seamlessly for the first couple of years but may lose support after prolonged use – by the fourth year of use. This seems not to be an issue as most reviewers say they can get a new mattress seeing the low price of the mattress. The Dreamfoam Bedding Arctic Dreams Mattress is created to reduce the heat of regular memory foam mattresses and offer a night of undisturbed sleep. To this end, it is infused with viscoelastic foam, Energex, which offers all the advantages of visco while offering a relatively quicker recovery. Dreamfoam Bedding designed this mattress as an alternative to latex and springs; it thus offers great pressure mapping characteristic while staying firm enough for support. 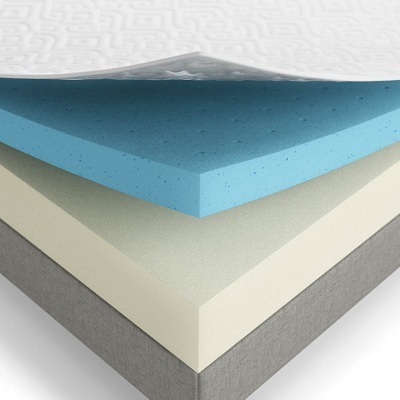 This is a 2-layered mattress with a 2-inch fast response Energex foam on top of a 6.25-inch high-density polyurethane foam. The whole mattress is then covered with a 0.75-inch quilting layer which gives the mattress a smooth and soft feel and ensures the mattress has the right support-comfort balance. It is CentriPUR-US certified which means it is tested for quality, performance and environmental friendliness. The mattress is offered with a 10-year warranty to guarantee its durability. Weighing less than 60 pounds, the mattress is easy to handle and move from one corner of your house to the other. It is shipped compressed. On Amazon.com, reviewers are in love with the soft quilt that covers this mattress and the ability to take heat away at night. According to reviews, these two characteristics coupled with the perfect balance of comfort and support makes the mattress a great option for a home bed. Again, its price is praised. However, some reviewers cite that the mattress is not ideal for heavy people as it gets soft after a few years of use. 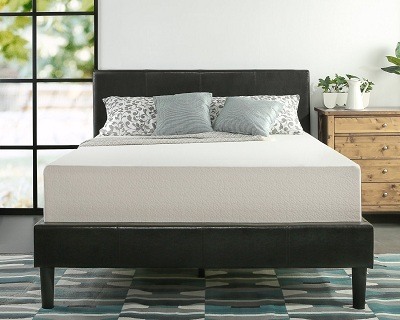 The Signature 10-Inch Contour Mattress is designed to offer the benefits of contoured vertebrae support. This means that the mattress conforms to the curves of your body ensuring that your weight is equally distributed and all pressure points are relieved. The independently encased coils minimize motion disturbance giving you a night of undisturbed sleep. Multiple polyester and foam layers add to the comfort and support of this mattress. A 2.5-inch high-density foam covers the top and the bottom of the independently encased coils; these features work together to give the user a balanced feel. 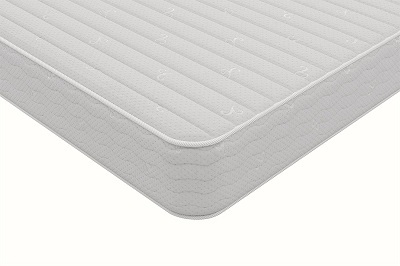 The middle portion 15-gauge independently enclosed coils make 7.5 inches of the mattress' thickness. It is covered with a soft, breathable fabric. It works well on a variety of beds including box spring beds, daybeds, trundle beds, bunk beds and platform beds. After unboxing, you will have to allow the mattress 48 hours to expand to its right size as it comes heavily compressed. It is offered light enough so you can fix it on your bed with ease. On Amazon.com, most reviewers on Amazon say that at first, the mattress looked like the ‘self-inflating' type but after full decompression, the mattress felt comfortable to sleep on. Though most reviewers cite that the mattress is comfortable, the comfort may last a few years shy of the 7-10-year industry recommended mattress lifetime. Allergy symptoms have increased in the last few months of using the mattress. There might even be bed bugs present. You may fear buying a mattress under $300 thinking you will get exactly what you pay for. However, there are great mattresses at that price. The best quality mattresses under 300 dollars are offered with great features to offer you comfort and support. Nevertheless, you need to consider that some manufacturers do not offer warranties on this mattresses and do not allow trials. We have you covered in our mattress under $300 reviews by selecting only mattresses that offer you warranty. The major worry that people have with relatively cheaper mattresses is their durability. In most cases the mattress will be worn out by the fifth year of use; this duration is two years shy of the recommended 7-10 years. If you have saved enough money by then, that means you are good to go. The good thing with these mattresses is that they are offered at a great price; this means replacing them will not be a big deal. While some people complain that their mattresses are very soft, other complain of firmness. When you sleep on a very soft mattress, you will likely wake up with an aching back, and when you sleep on a very firm mattress, you are likely to wake up with tingling arms. According to WebMD, a good mattress is supposed to support your entire body in a neutral position; one in which your shoulder, buttocks, heels and head are in alignment and your spine has assumed a nice curvature. To this end, very firm mattresses push these pressure points while very soft mattresses do not support these pressure points properly. Granted, one brand of mattress is not better than others. You only need to choose a mattress that offers a medium-to-firm feel. According to WebMD, research has shown that those who sleep on relatively firmer mattresses have a lower risk of experiencing back pains. Some mattresses are offered with lifetime warranty and others with warranties that run up to 25 years. However, you should not keep a mattress for more than seven years. 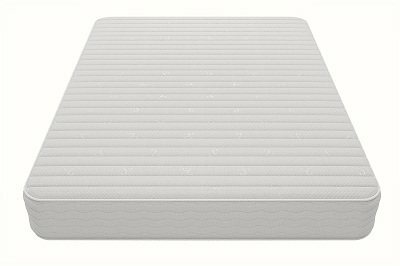 We love the Zinus Memory Foam 12-Inch Green Tea Mattress among other mattresses in this review. It is offered firm for maximum support yet soft enough to relieve pressure points. It lasts longer compared to other mattresses in its price bracket and retains its firmness even after a couple of years of use. It is light enough and can be fixed fast on any home bed. With edge support, this mattress allows you to sit at the edge of your bed and relax. Its three-layered design enhances its performance while its infusion of green tea extract reduces the chemical smell associated with memory foam mattresses. If you are looking for performance, this might be the best mattress under $300 for you.